Spencer Kelly visits the Warner Bros archive in Los Angeles to meet the people painstakingly restoring old films using the latest technology. All film deteriorates, end of the story. 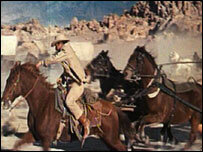 The 1962 epic How the West Was Won is a case in point. The last 46 years have not been kind to the reels of film making up the multi-Oscar winning epic - the colour has faded, the landscape is marred by dirt and scratches, and there are strange vertical lines in every shot. Ned Price is part of Warner Bros technical operations team and he said he is usually dealing with films which are turning to "powder". "I'm dealing with film which is dehydrated, shrunken and buckled," he said. "As that happens the film shrinks and warps at an inconsistent rate. "We're now working on digital techniques to actually record it as it moves and morphs and then digitally, after the fact, sort of stabilise the image itself." For all film studios, it is important that old classics look pristine when they are resold on DVD and Blu-ray. 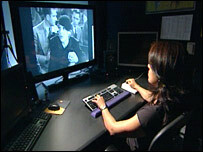 The digital remastering process begins by scanning the reels of film, frame by frame at 2,000 pixels across, about the resolution of high definition TV. At this resolution the machine can scan 18 frames a second, meaning the film moves through the scanner at about two thirds of the true speed. Every single frame can generate 13MB of data. Increasingly, the studios are scanning at 4,000 and even 6,000 pixels across, in order to prepare the films for even higher resolution. Scanning at these resolutions generates immense amounts of data - a typical 4,000 pixel film will take up at least 12TB, before any work is done on it. Luckily, Warner Bros has a rack of machines which provide one petabyte (1000 terabytes) of storage. One of the first people to see the scanned film is Cathy Quiroz, who spends her days looking for dirt and scratches in every single frame of film. It is a semi-automated process - she spots the spots and the computer then borrows pixels from the frame before and after to mend the blemish. Considering what is involved, it may be tempting to program a computer to take over from Ms Quiroz completely. But Bill Baggelaar, a Warner Bros engineer, said the human touch is still very much needed. "We can use computers to automate the process of dirt and scratch removal but we find that people tend to do a better job," he said. 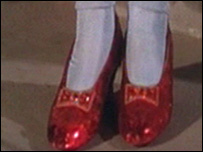 "In The Wizard of Oz the computers wound up removing Dorothy's slippers from the shot entirely because they sparkled and were different on every frame. We wound up having to put them back into the shot." How the West Was Won was more difficult than most to restore - three times as difficult in fact. In order to dazzle audiences with super-wide vistas, the movie was filmed on three cameras positioned side-by-side, and then the resulting three rolls of film were stitched together and run through three adjacent projectors. It is an effect called Cinerama and it has given colourist Ray Grabowski something to really get his teeth into. Each frame is 6,000 pixels wide and since the three rolls of film have all aged differently, each third of a frame has faded or warped to a different degree. Sitting at a desk that could have been ripped out of the Starship Enterprise, Mr Grabowski uses colour curves, scopes, and his keen eye to match the colour and contrast of each part of the frame. "The first thing we'll do is adjust contrast to even out the blacks and whites so they're not clipped or just a weird colour," he said. "From there we'll start to enhance the picture with colour saturation. We'll also work on skin tones, because those are very important." The stitches between the three parts of the image also need to be removed. Using techniques familiar to the photoshoppers among us, he blurs the offending area of the image using a particular shaped mask. Digital restoration is certainly breathing new life into old timers, but will today's films ever need the same treatment? More and more films are being shot digitally and even though most are still shot on film, these are routinely scanned to digital in order to edit and add CGI. Carolyn Giardina of The Hollywood Reporter said many in the industry feel "film negative is still the only proven archival medium". "With digital cameras there are films now which don't have any elements in film," she said. 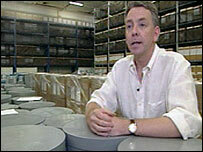 "So there is enormous concern when they're looking into digital archiving. They feel none of the digital techniques are proven at this stage of the game." It must be tempting to use computers for more than just clean up - maybe even to improve old special effects that are less than convincing by today's standards? Chuck Dages, who works in Warners' emerging technologies department, said they were able to remove the strings operating the flying monkeys in the Wizard of Oz. "Bad special effects are different than correcting or changing the story. In some instances it's just a natural thing: now we can do it, let's do it," he said. The debate about how much technology should be used to improve on old masters is one that is likely to grow in the future. Right now, it means that we can meet the Wizard with no strings attached, and Dirty Harry is not quite so dirty.